The VWR Performance Series Laboratory Freezer offers you precise digital control and temperature management ideal for keeping critical samples and supplies. This microprocessor-controlled lab freezer has 30 cu ft, with inner fast freeze compartments, covered by individual doors, allowing users to access samples while maintaining conditions in other areas. The VWR Series freezer has a temperature range of between -15° and -25°C that can be set from the upfront control panel with touch screen operation. From this panel users can also access a 24 hr temp chart, min and max history, electronic owner’s manual and troubleshooting guide, as well as add password protection to prevent accidental tampering. This -20°C Freezer can also be connected to a PC through a USB port for the transfer of data acquired by the freezer such as 24/7 logging and histories. Temperatures are monitored constantly, and should parameters deviate from set points, alarms will sound, users may also connect remote alarms through the contacts as back up. 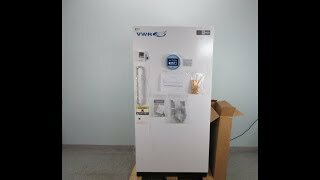 This VWR Performance -20°C Lab Freezer is brand new, scratch & dent model. Freezer has been fully tested by our service team with a clean bill of health as part of our QC process. MSRP: $12,919.74. All of our lab equipment comes backed with our standard warranty. Should you have any questions, please don't hesitate to contact us.